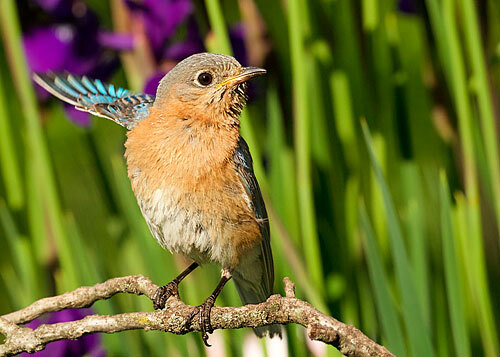 Eastern Bluebirds wave. Just lift one wing, as if saying Hi there! or I'm still here! The male does it a lot while courting. But this morning the female did it a few times. Not to her mate, I think, because the male was already out of sight, air freighting a load of mealworms to the bird box in the garden. Could she have meant to get my attention? Asking me to hurry up and replenish the mealworms? I have no way of knowing, but it was awesome. 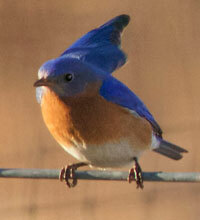 Male bluebird doing the wave. 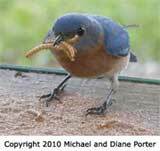 Put a few mealworms in the mealworm feeder each day, and your bluebirds will quickly learn this is their own feeder. It will outlast wood. It's made of recycled plastic, so it helps the environment, too.